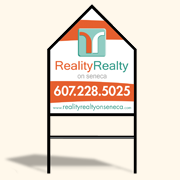 Need custom realtor yard signs and frames? 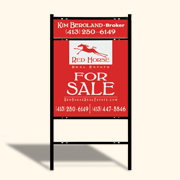 Dee Sign sells complete real estate signs combining the panels and frames for the size you're looking for with optional room for riders or inserts. 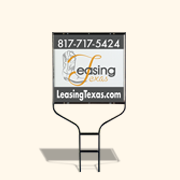 Our yard signs and frame units are made to last with your choice of materials, including steel and corrugated plastic for maximum savings. 18x24 Sign and frame. Two 6x24 rider spaces. 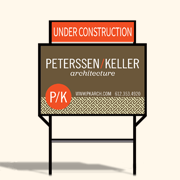 24x30 Sign and frame. One 6x30 rider space. 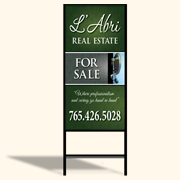 24x24 Sign and frame. One 6x24 rider space. 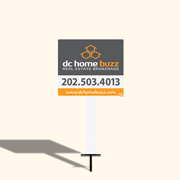 20x28 Sign and frame. One 6x28 rider space. 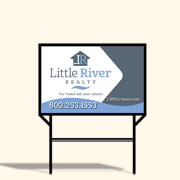 24x18 Sign and Frame. Two 6x18 rider spaces. 18x24 Sign and frame. One 6x24 rider space. 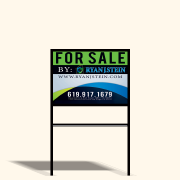 20x28 Sign and frame. Two 6x28 rider spaces. 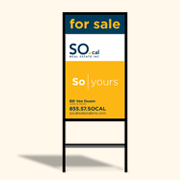 28x30 Sign and frame. One 6x30 rider space. 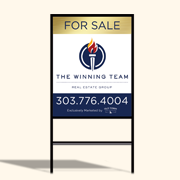 24x36 Sign and frame. One 6x36 rider space. 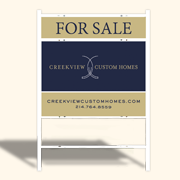 20x30 Sign and frame. Two 6x24 rider spaces. 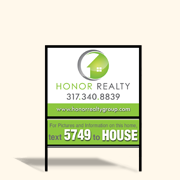 20x30 Sign and frame. One 6x24 rider space. 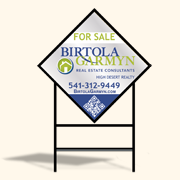 24x24 Diamond Sign Panel and frame. One 6x24 rider space. 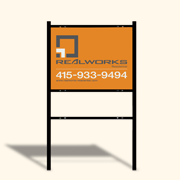 30x24 Beveled Sign and frame. One 6x24 rider space. 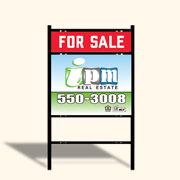 36x18 Sign and frame. One 6x18 rider space. 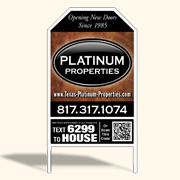 30x24 House shaped sign and frame. One 6x24 rider space. 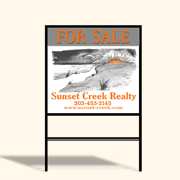 24x24 Sign and frame. Two 6x24 rider spaces. 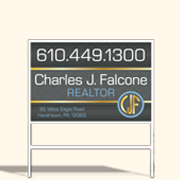 30x24 Sign and frame. One 6x24 rider space. 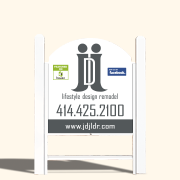 30x24 Dome shaped sign and frame. One 6x24 rider space. 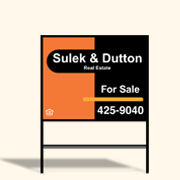 24x24 Sign and frame. Holds a 6x24 rider on top and a 6x18 rider below. 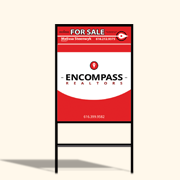 20x28 Sign and frame. Holds a 6x24 rider on top and a 6x18 rider below. 18x24 Sign and frame. Holds a 6x24 rider on top and a 6x18 rider below. 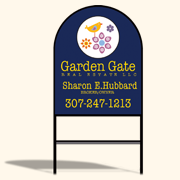 12x18 Sign and frame. One 6x18 rider space.